SUREFIRE’s master control center where firing production variables such as heating rate, temperature profile, cooling cycles can be adjusted and controlled precisely. Our human machine interface system you get a simplified operator interface and graphic displays that provide essential information and ease of control leaving almost nothing to chance which minimizes the need for operator intervention. With our HMI system, what you see is what you get. 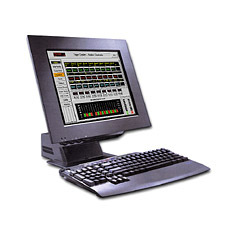 Its easy to use, shortens operator training time and dramatically increases productivity. In this limited space, we can only touch on the hmi system to give you a glimpse of its versatility. For instance, this Overview screen displays the entire casting operation at a glance, showing all of the critical process values. Our intuitive menu bar gives you a simple, fast way to access specific operator screens. For example, selecting Interlocks, displays the system interlocks screen. Here you can quickly see whether or not all system conditions are “okay” and can start or stop the casting process. We’ve also included a recipe button to allow pre-configured operating recipes to be selected and downloaded on the fly. The Heaters screen displays the temperatures of the heat zones in the oven. Simply select modify setpoints to establish a precise drying temperature profile. The Clock screen displays the controls for automatic start and stop programming of the production operation. The Alarms screen displays the status of alarms including date and time stamps, history and help screens along with provisions for memos and commentary. And then there’s more. SUREFIRE’s powerful Real Time and Historical Trending capabilities make it possible to manage your production and stay way ahead of the competition. In fact, this hmi system is completely scalable and can be used throughout your factory to provide solutions from the production line to the back office. Its quite possibly the most versatile human machine interface on the planet.